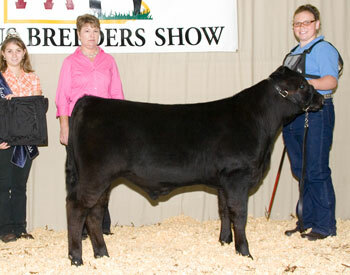 Rains Barbie DsRlD won champion spotlight heifer at the 2009 Pennsylvania Angus Breeders Junior Show, July 2-4 in Huntingdon, Pa. Andrew Cranmer, Butler, Pa., owns the winning heifer. Just Enuff HotRod Ms Kaplunk won reserve champion spotlight heifer at the 2009 Pennsylvania Angus Breeders Junior Show, July 2-4 in Huntingdon, Pa. Kayce Myers, Wellsville, Pa., owns the winning heifer. 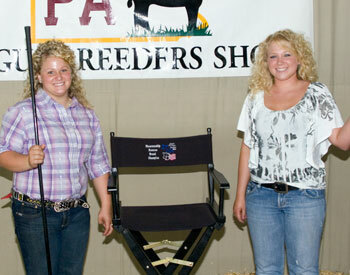 Katrina Frey, Quarryville, Pa., right, won the premier breeder award at the 2009 Pennsylvania Angus Breeders Junior Show, July 2-4 in Huntingdon, Pa. Lindsay Upperman, Pennsylvania Angus princess, left, presented the award. 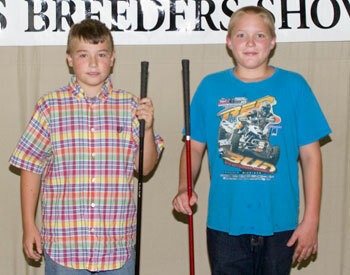 These young enthusiasts won pee wee showmanship honors at the 2009 Pennsylvania Angus Breeders Junior Show, July 2-4 in Huntingdon, Pa. Pictured from left includes Hunter Voight, Fredericksburg, Pa., reserve champion, and Dale Gazda, Ruffs Dale, Pa., champion. 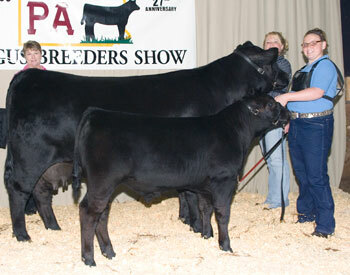 These individuals won junior showmanship honors at the 2009 Pennsylvania Angus Breeders Junior Show, July 2-4 in Huntingdon, Pa. Pictured from left includes Alexis Cash, York, Pa., champion, and Alysha Sweitzer, Wellsville, Pa., reserve champion. 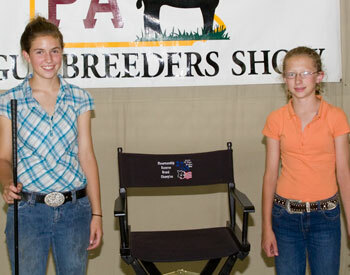 These individuals won intermediate showmanship honors at the 2009 Pennsylvania Angus Breeders Junior Show, July 2-4 in Huntingdon, Pa. Pictured from left includes Hannah Grim, East Berlin, Pa., champion, and Kate Livingston, Dover, Pa., reserve champion. 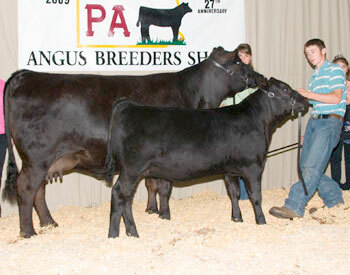 These Angus enthusiasts won senior showmanship honors at the 2009 Pennsylvania Angus Breeders Junior Show, July 2-4 in Huntingdon, Pa. Pictured from left includes Kimberly Long, Airville, Pa., reserve champion, and Jaclyn Upperman, Chambersburg, Pa., champion. 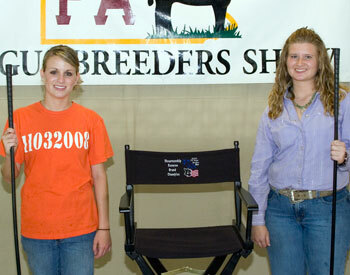 These individuals won overall showmanship honors at the 2009 Pennsylvania Angus Breeders Junior Show, July 2-4 in Huntingdon, Pa. Pictured from left includes Hannah Grim, East Berlin, Pa., champion, and Jaclyn Upperman, Chambersburg, Pa., reserve champion. 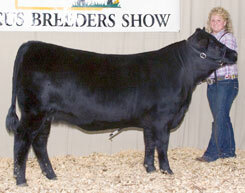 DCC Precisely Belle 713 won grand champion owned female at the 2009 Pennsylvania Angus Breeders Junior Show, July 2-4 in Huntingdon, Pa. Shelby Dean, New Castle, Pa., owns the October 2007 daughter of W C C Precision E161 J239. She first claimed senior champion. Katherine Meadows, Buchanan, Va., evaluated the 93 entries. 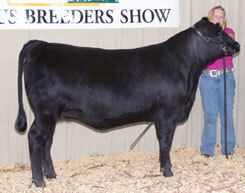 B C A Grace Peacemaker S89 won reserve grand champion owned female at the 2009 Pennsylvania Angus Breeders Junior Show, July 2-4 in Huntingdon, Pa. Haley Sweitzer, Wellsville, Pa., owns the March 2008 daughter of S A V Peacemaker 3179 that first claimed junior champion. Katherine Meadows, Buchanan, Va., evaluated the 93 entries. 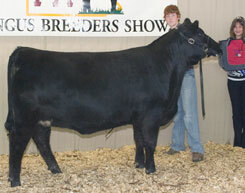 SHEN-VAL 1961 7V01 Desire won owned reserve senior champion female at the 2009 Pennsylvania Angus Breeders Junior Show, July 2-4 in Huntingdon, Pa. Alana Eisenhour, Wellsville, Pa., owns the winning female. P S Juliet 638 804 won owned reserve junior champion heifer at the 2009 Pennsylvania Angus Breeders Junior Show, July 2-4 in Huntingdon, Pa. Marshall McKean, Mercer, Pa., owns the winning heifer. Echo Dell Cookie 9015 won owned intermediate champion heifer at the 2009 Pennsylvania Angus Breeders Junior Show, July 2-4 in Huntingdon, Pa. Kimberly Long, Airville, Pa., owns the winning heifer. Just Enuff Myron's Sapphire won owned reserve intermediate champion heifer at the 2009 Pennsylvania Angus Breeders Junior Show, July 2-4 in Huntingdon, Pa. Kimberly Long, Airville, Pa., owns the winning heifer. 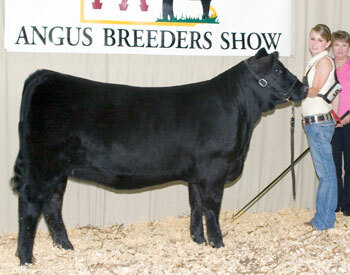 Weaverland Blkcp Wisdom 835 won owned senior heifer calf champion at the 2009 Pennsylvania Angus Breeders Junior Show, July 2-4 in Huntingdon, Pa. Sarah Lownes, Honey Brook, Pa., owns the winning heifer. 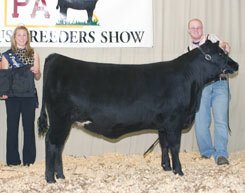 B C A Scaara NetWorth 810 won grand champion bred-and-owned female at the 2009 Pennsylvania Angus Breeders Junior Show, July 2-4 in Huntingdon, Pa. Hannah Grim, East Berlin, Pa., owns the June 2008 daughter of S A V Net Worth 4200. She first won intermediate champion. Katherine Meadows, Buchanan, Va., evaluated the 93 entries. 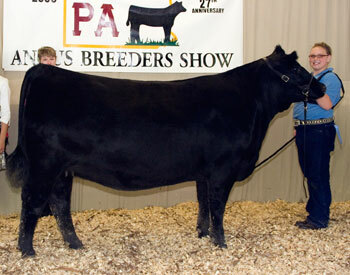 B C A Scaara Paris H89 won reserve grand champion bred-and-owned female at the 2009 Pennsylvania Angus Breeders Junior Show, July 2-4 in Huntingdon, Pa. Hannah Grim, East Berlin, Pa., owns the May 2008 daughter of S A V Net Worth 4200. 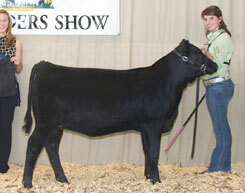 She first won reserve intermediate champion. 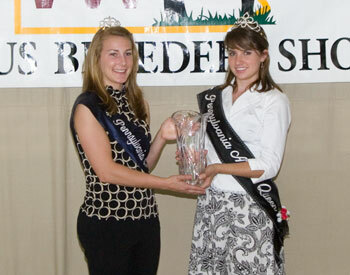 Katherine Meadows, Buchanan, Va., evaluated the 93 entries. 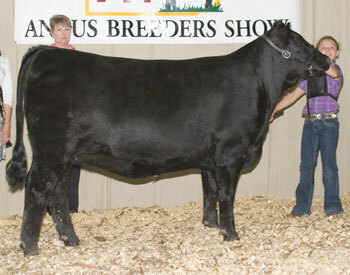 Freys KJF Ark Pride M35 S107 won bred-and-owned senior champion female at the 2009 Pennsylvania Angus Breeders Junior Show, July 2-4 in Huntingdon, Pa. Katrina Frey, Quarryville, Pa., owns the winning female. 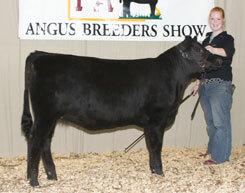 BV Woodland Elba 408 won bred-and-owned junior champion heifer at the 2009 Pennsylvania Angus Breeders Junior Show, July 2-4 in Huntingdon, Pa. Andrea Foore, Seven Valleys, Pa., owns the winning heifer. 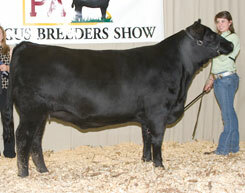 Freys KJF Delia M90 T26 won bred-and-owned reserve junior champion heifer at the 2009 Pennsylvania Angus Breeders Junior Show, July 2-4 in Huntingdon, Pa. Katrina Frey, Quarryville, Pa., owns the winning heifer. 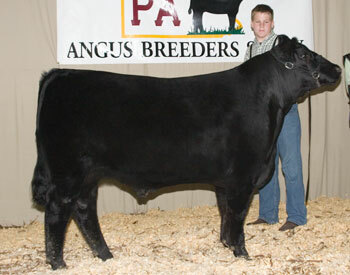 L V A Ginger Snap 806 won bred-and-owned senior heifer calf champion at the 2009 Pennsylvania Angus Breeders Junior Show, July 2-4 in Huntingdon, Pa. Kurt Long, Airville, Pa., owns the winning heifer. 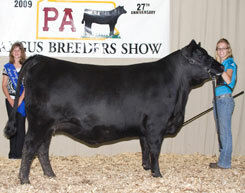 Freys KJF Arkpride P48-T105 won bred-and-owned reserve senior heifer calf champion at the 2009 Pennsylvania Angus Breeders Junior Show, July 2-4 in Huntingdon, Pa. Katrina Frey, Quarryville, Pa., owns the winning heifer. 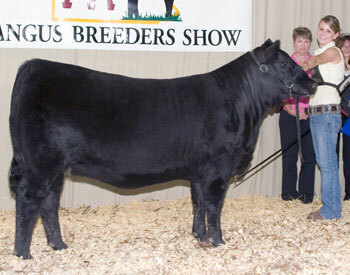 Freys KJF Delia M90-U46 won bred-and-owned heifer calf champion at the 2009 Pennsylvania Angus Breeders Junior Show, July 2-4 in Huntingdon, Pa. Katrina Frey, Quarryville, Pa., owns the winning heifer. 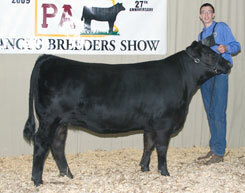 KML 712 Erica's Patricka 907 won bred-and-owned reserve heifer calf champion at the 2009 Pennsylvania Angus Breeders Junior Show, July 2-4 in Huntingdon, Pa. Kyle Livingston, Dover, Pa., owns the winning heifer. 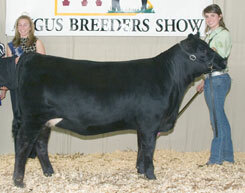 Freys KJF Forward P48 T72 won grand champion bred-and-owned bull at the 2009 Pennsylvania Angus Breeders Junior Show, July 2-4 in Huntingdon, Pa. Katrina Frey, Quarryville, Pa., owns the March 2008 son of Connealy Forward. Katherine Meadows, Buchanan, Va., evaluated the 93 entries. 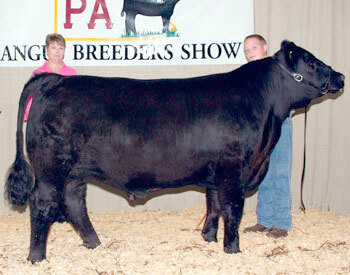 DCC Full Moon 9211 won reserve grand champion bred-and-owned bull at the 2009 Pennsylvania Angus Breeders Junior Show, July 2-4 in Huntingdon, Pa. Shelby Dean, New Castle, Pa., owns the March 2009 son of B/R New Frontier 095. Katherine Meadows, Buchanan, Va., evaluated the 93 entries. 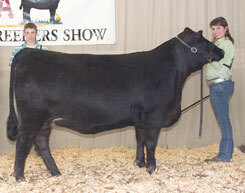 K J F Delia K48-M90 won grand champion cow-calf pair at the 2009 Pennsylvania Angus Breeders Junior Show, July 2-4 in Huntingdon, Pa. Katrina Frey, Quarryville, Pa., owns the April 2003 daughter of T O F Famous F05 K26. 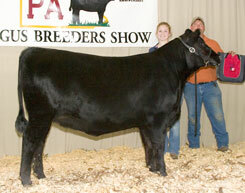 A February 2009 heifer calf sired by B C Marathon 7022 is at side. Katherine Meadows, Buchanan, Va., evaluated the 93 entries. DCC Brianna 703 won reserve grand champion cow-calf pair at the 2009 Pennsylvania Angus Breeders Junior Show, July 2-4 in Huntingdon, Pa. Shelby Dean, New Castle, Pa., owns the March 2007 daughter of DCC Belle's Traveler 406. A March 2009 son of B/R New Frontier 095 is at side. Katherine Meadows, Buchanan, Va., evaluated the 93 entries. 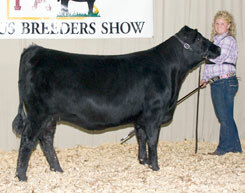 B C A Terminator D83 won grand champion owned steer at the 2009 Pennsylvania Angus Breeders Junior Show, July 2-4 in Huntingdon, Pa. Alana Eisenhour, Wellsville, Pa., owns the May 2008 son of S A V Net Worth 4200. He weighed 1,358 pounds. Katherine Meadows, Buchanan, Va., evaluated the 93 entries. 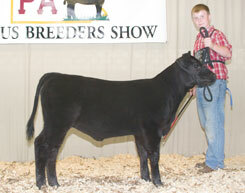 B V Bullfrog won reserve grand champion owned steer at the 2009 Pennsylvania Angus Breeders Junior Show, July 2-4 in Huntingdon, Pa. Logan Foore, Seven Valleys, Pa., owns the March 2008 son of S A V 8180 Traveler 004. He weighed 1,228 pounds. Katherine Meadows, Buchanan, Va., evaluated the 93 entries. 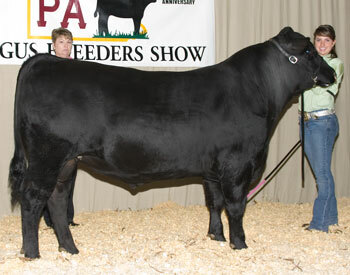 Sunnyhill G-Force won grand champion bred-and-owned steer at the 2009 Pennsylvania Angus Breeders Junior Show, July 2-4 in Huntingdon, Pa. Dale Gazda, Ruffs Dale, Pa., owns the March 2008 son of Northern Improvement 4480 GF. He weighed 1,380 pounds. Katherine Meadows, Buchanan, Va., evaluated the 93 entries. 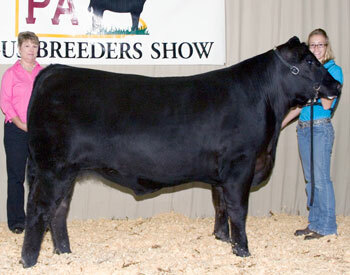 RM Hank 8046 won reserve grand champion bred-and-owned steer at the 2009 Pennsylvania Angus Breeders Junior Show, July 2-4 in Huntingdon, Pa. Rachel McKean, Mercer, Pa., owns the February 2008 son of C R A Bextor 872 5205 608. He weighed 1,434 pounds. Katherine Meadows, Buchanan, Va., evaluated the 93 entries. 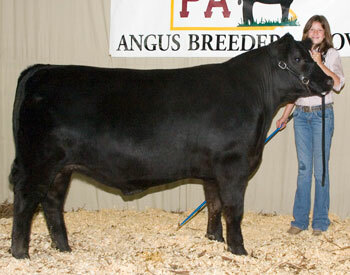 Photos by American Angus Association.